Simon & Schuster, 9781451689761, 304pp. In this compelling debut novel, an art authenticator and an art historian are employed by a famous, reclusive painter to sell a never-before-seen portrait, leading them to discover devastating secrets two sisters have kept from each other, and from the artist who determined the course of their lives. How do you find someone who wants to be lost? In The Gravity of Birds histories and memories refuse to stay buried; in the end only the excavation of the past will enable its survivors to love again. "If literary fiction is on the verge of extinction . 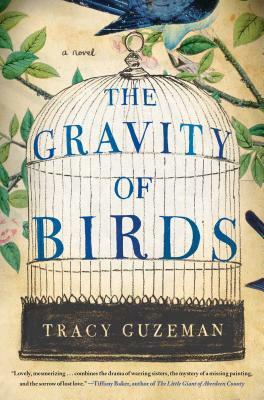 . . Tracy Guzeman's The Gravity of Birds ought to inspire new hope for an endangered species. With its deft interweaving of psychological complexity and riveting narrative momentum, with its gorgeous prose and poetic justice, Guzeman's book is about sibling rivalry, tragedies, and resurrections. And it's irresistibly exquisite." "The captivating prose of Tracy Guzeman’s first novel instantly pulls you into the lives of the Kessler sisters, Alice and Natalie, and their intertwined love story with Thomas Bayber, an attractive young artist. Forty years later, as Bayber lies dying, he sends two trusted, but disparate, colleagues to find a missing painting that the Kessler sisters possess. Clandestine love affairs, painterly clues and a world of untruths come seamlessly together in this exceptional debut." "In this richly textured novel, two young sisters encounter art and their sensuality under the watchful gaze of a seductive painter. Forty-four years later, when a never-before-seen portrait of them is unveiled, a complex web of jealousy and heartache is exposed." "In this riveting debut novel, a famous artist-recluse unveils a 40-year-old painting never shown before, then sends collectors on a scavenger hunt to locate two teenage girls who posed for him, but disappeared decades ago." "The deep waters of family secrets contribute to the atmosphere of intrigue." "Talented . . . incredibly assured . . . her cast of endearing eccentrics and her stellar prose will win a loyal audience." "The Gravity of Birds is one of those rare, exquisitely written novels that haunt you long after you've finished the last page. Guzeman writes of both the fragility of the human spirit and its inner strength. The book unfurls like a hidden canvas, soaked with color, emotional longing, and a desire to make sense of what is often too painful to be said without the assistance of art. It is a novel not to be missed."